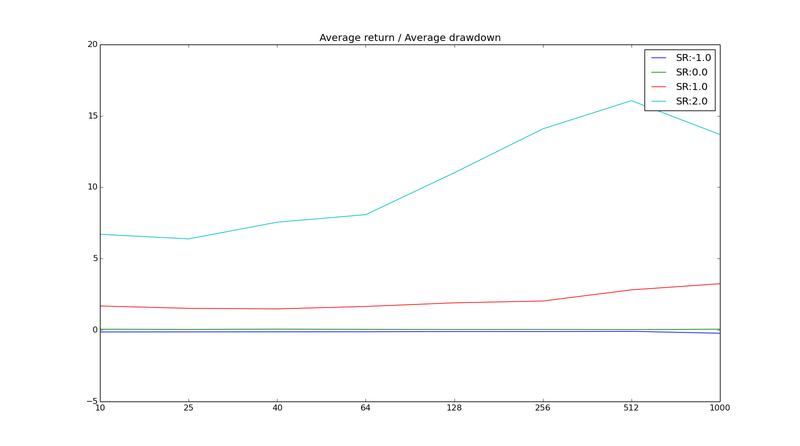 Everyone knows that the usual naive method of portfolio optimisation is, well, a bit rubbish. This isn't because the method is flawed, but it relies on the inputs being 100% accurate, or to put it another way we need to know precisely what the mean, volatility and correlation of future returns are going to be. But most peoples crystal balls are somewhat foggy. Fortunately there are a few methods we can use to deal with this problem. Some of these are straightforward; like the handcrafted method I describe in my book. Others such as bootstrapping and shrinkage are more complicated. On any particular set of asset price history one method or another may perform better. It's even possible that just by fluke the simplest naive method will do best. I believe that to get a good grasp of which portfolio optimisation is best you need to use random data; and I'll do exactly that in this post. This is the third and final post in a series on using random data. The first, which is worth reading before this one, can be found here. The second post is optional reading. You may also want to read this post which shows some optimisation with real data and explains some of the concepts here in more detail. I'm using straightforward Markowitz optimisation. We maximise the Sharpe Ratio of a portfolio, over some portfolio weights, given the expected mean, standard deviation, and correlation of returns. Because I'm optimising the weights of trading systems I constrain weights to be positive, and to sum to 100%. I can also assume that my systems have the same expected volatility of returns, so all I need is the mean (or Sharpe Ratio) and correlation. Finally I don't expect to see negative correlations which makes the problem more stable. The 'one period' or naive method is to take all past returns and estimate Sharpe Ratios and correlations; and then plug these estimates into the model. The flaw of this method is it ignores the huge uncertainty in the estimates. Method two - bootstrapping - involves repeating our optimisation many times over different parts of our data, taking the resulting weights, and averaging them out. So the weights are the average of many optimisations, rather than one optimisation on the average of all data. The logic for bootstrapping is simple. I believe that the past is a good guide to the future; but I don't know which part of the past will be repeated. To hedge my bets I assume there is an equal chance of seeing any particular historical period. 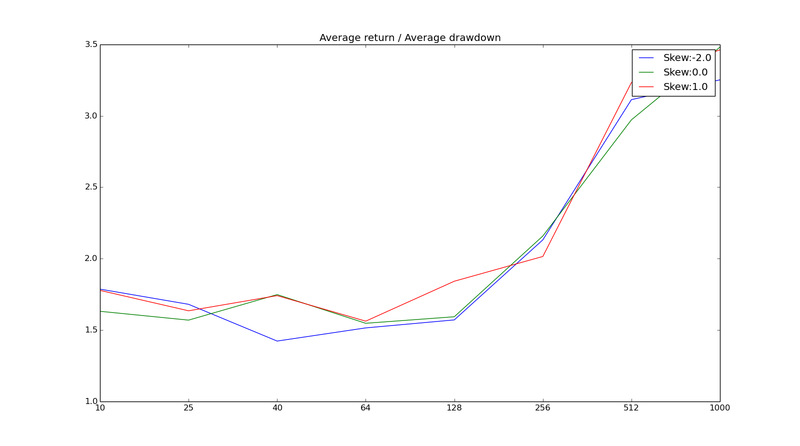 So it's logical to use an average of the portfolios which did best over all previous periods. Shrinkage is a Bayesian method which involves taking the estimated Sharpe Ratios and correlation, and then "shrinking" them towards a "prior". There are numerous ways to do this, but I'm going to use a relatively simple variation. "Shrinking" involves taking a weighted average of the estimated correlation matrix (or mean vector) and the prior; the weighting on the "prior" is the shrinkage factor. For "priors" I'm going to use the "zero information" priors - equal Sharpe Ratios, and identical correlations. By the way the nemesis of all optimisations, the very simplest method of equal weights, is equivalent to using the shrinkage method of a shrinkage factor of 100%. 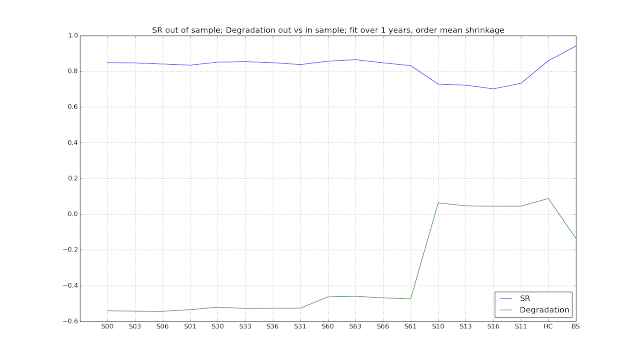 It should also be obvious that using 0% shrinkage is the same as a naive optimisation. Handcrafting is a simple robust method I describe in chapter four of my book. We estimate correlations, and then use a lookup table to determine what weights to use. I'm going to use the extended table which is here. * There is an extension in my book to the hand crafted method which incorporates estimated Sharpe Ratios; but to keep life simple I won't be discussing it here. I'm going to use the technique I described in the first post in this series for producing random returns for 3 assets. I'm going to use three because it will make the results more tractable and intuitive. It also means I can use the handcrafted method without creating a complex grouping algorithim. The general results will still apply with more assets. The portfolio I'm going to generate data from has identical Sharpes (in expectation), and correlations of 0.8, 0, 0. So it's very similar to the portfolio of two equity indicies and one bond index I consider in this post. Note that the set of correlations is deliberately different (mostly) from the set used by the handcrafted method, just to ensure there is no favouritism here. The usual caveat about random data applies here. The expected sharpe ratio, volatility and correlation of returns in this random world is fixed; but in reality it varies a lot. Nevertheless I think we can still draw some useful conclusions by using random data. Be warned though that non robust methods (such as the classic naive method) will do even worse in the real world than they do here. All my testing will be done on out of sample windows*. So I'll use data in the past to estimate sharpe ratio and correlations, coming up with some weights, and then run those weights for a year to see how the portfolio behaves. The amount of history you have is critical, particularly with this stylised example where there is a fixed data generation process to be 'discovered'. I ran tests with available asset price histories of 1 year, 5 years, 10 years and 20 years for the in sample period, with 1 year for the out of sample period. * this term is explained more in chapter three of my book, and in this post. To keep things simple I'll just be using the average out of sample sharpe ratio as my measure of how successful a given method is. 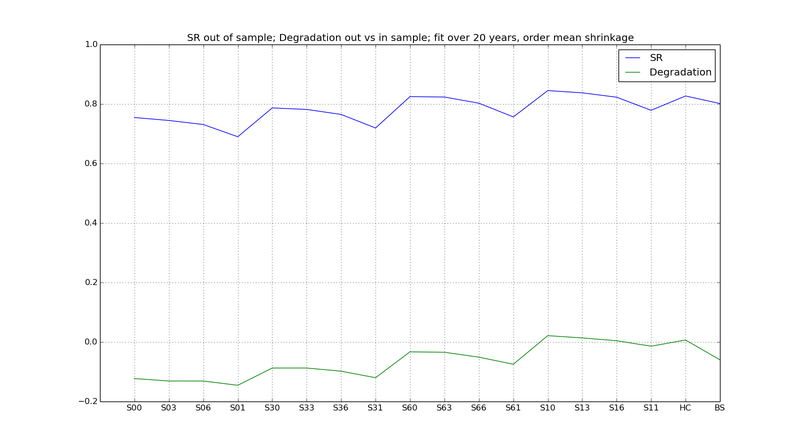 Just for fun I'll also measure the average degradation of Sharpe ratio for the optimised weights between in sample, and out of sample. I'm going to going to basically compare the four methods against each other, and see which does best on at out of sample basis. Actually I'm going to compare 18 (!) 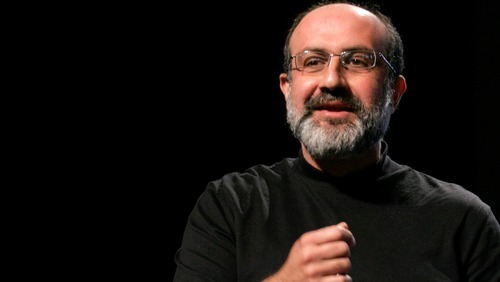 methods- hand-crafted and bootstrapping; plus shrinkage with a shrinkage factor of 0% (which is equivalent to the naive method), 33%, 66% and 100% (which is equivalent to equal weighting); note because I allow different shrinkage factors on the mean and correlation that adds up to 16 possibilities. All these graphs have the same format. The x axis shows which of the 18 methods are used. Note the abbreviations: H/C is handcrafted (which is also the benchmark), BS is bootstrapped and Sab implies shrinkage of a on asset Sharpe Ratios and b on correlations; where 0,3,6 and 1 represent 0%, 33%, 66% and 100%. Naturally S00 is the naive method and S11 is equal weights. The y axis shows eithier the average out of sample SR versus a benchmark (S00), or the average degradation from in sample to out of sample (negative means returns got worse). I plot the methods with shrinkage for the mean increasing as we go to the right (S11 - equal weights, BS and HC are on the extreme right; the naive portfolio S00 on the extreme left). Naturally because this is random data I've generated a number of series of asset returns for each set of asset sharpe ratios and correlations; and the results are averaged over those. There is some (messy) code here. The results above are from using just one year of data. Adding shrinkage to correlations seems to make things slightly worse, but shrinking the means improves things. The handcrafted method does best, with bootstrapping coming in second. 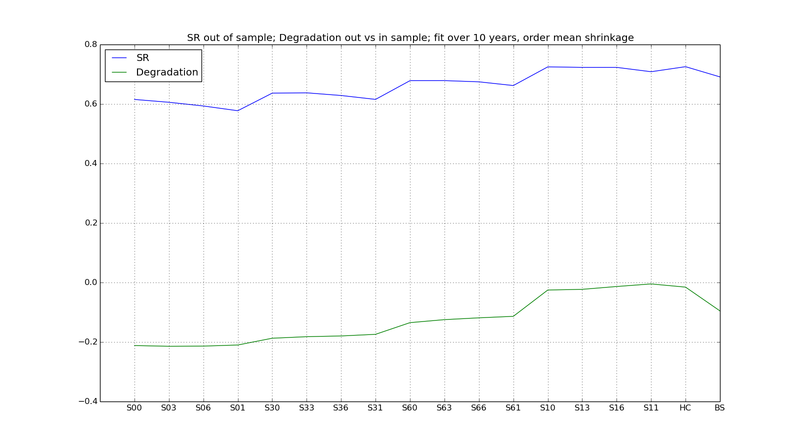 The scale is a little misleading; going from the worst to the best method is an improvement in SR from around 0.53 to 0.68. 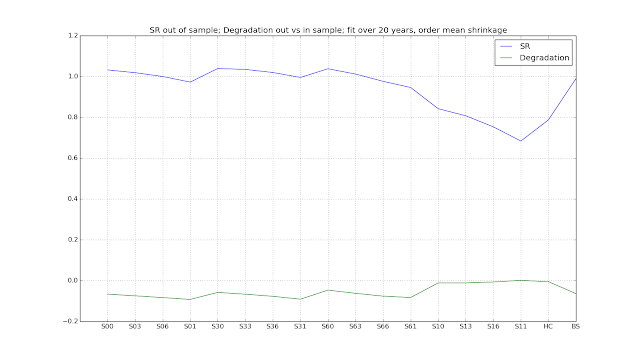 Unsurprisingly without sufficient shrinkage on the means there is massive degradation in the Sharpe Ratio going from in sample to out of sample. Look at S00 the naive method. Out of sample it has an average SR of 0.58; in sample it is 0.78 higher than this, at 1.36! 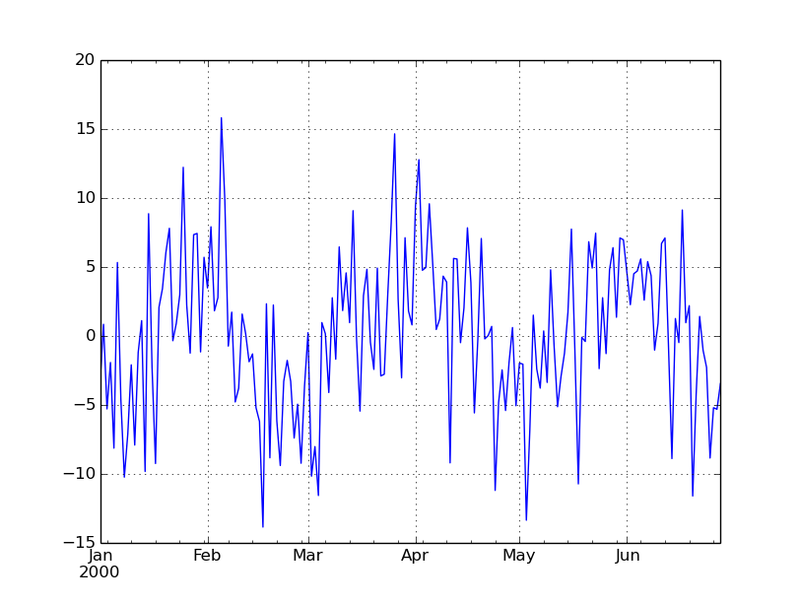 Using a non robust optimisation method over such a short period of data is going to give you seriously . With twenty years of data the naive method is doing a little better. Shrinking the correlations definitely penalises performance - we now have enough data to be confident that the correlations are significant. However there is still a benefit from shrinking the means; even completely away. The advantage of handcrafting and bootstrapping has been whittled away, but they are still amongst the best methods. There is still a degradation in performance going out of sample, but it is much smaller than before. To an extent these results are a function of the underlying portfolio. If we ran these tests with a portfolio that had significant mean differences then shrinking the mean wouldn't be such a good idea. Here for example are the results with the same correlations as before, but Sharpe Ratios of [0.0, 0.5, 1.0]. 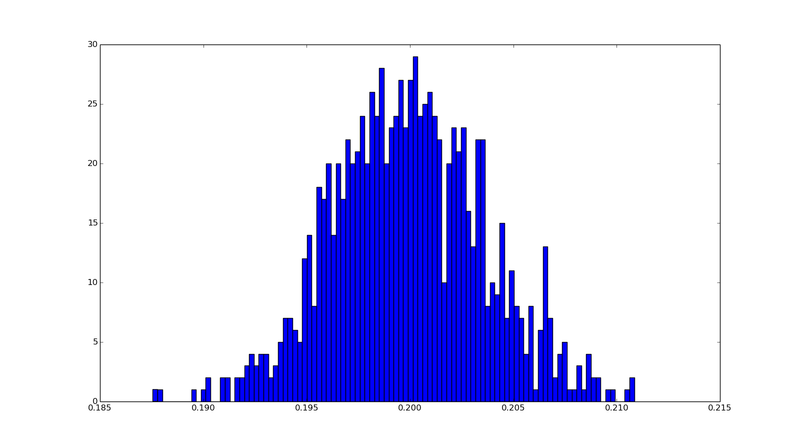 Here the optimal shrinkage for the mean seems to be between 33% and 66%. Handcrafting, which in the simple form here does not account for differences in sharpe ratios, doesn't do as well as bootstrapping which does. It also loses out once the shrinkage methods have enough data to use the difference in Sharpe ratios properly. However we don't know in advance what kind of portfolio we have... and significant differences in correlations are more common than statistically different Sharpe Ratios. I naturally have a soft spot for my preferred method of bootstrapping and handcrafting. Shrinking can be a good alternative, but it's hard to get the shrinkage factor correct. 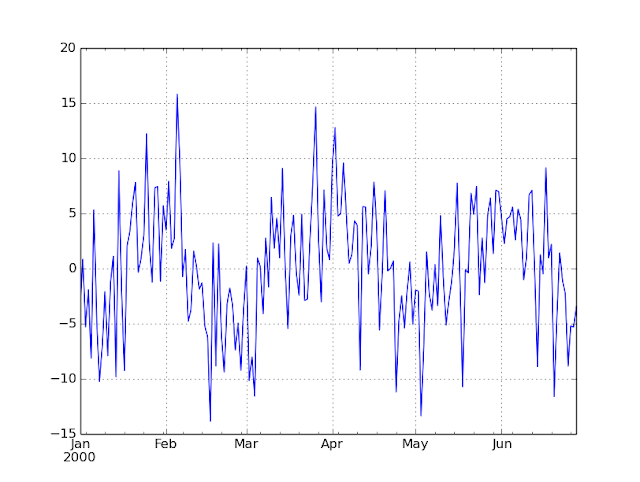 In general you need to shrink mean estimates more than correlations, and shrink more when you have less data history. 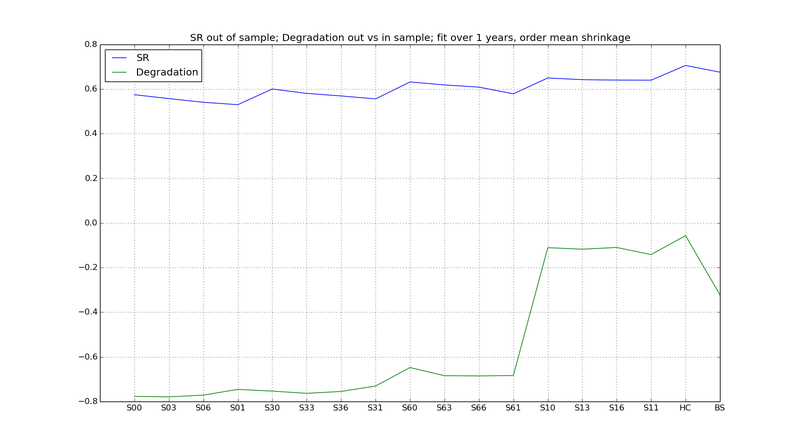 Using insufficient shrinkage; or none at all with the naive method, will also lead to massive degradation from in sample to out of sample returns. This was the final post in a series on using random data. Second post: Does equity curve trading work? Just a quick post today. As most of you know until a couple of years ago I worked for a large systematic hedge fund. Now I manage my own money. I'm doing similar things (systematically trading futures, with a holding period averaging a few weeks, and a variety of trading rules with a trend following bias). 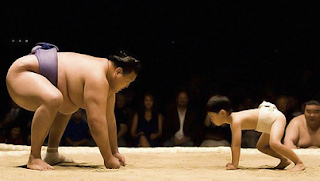 An interesting question, which I'm often asked, is can a little guy like me compete with a giant behemoth of a fund? Should we little guys just give up? After all surely a huge fund has a number of advantages over a one person "business" like mine. Or does it? Let's weigh up the pros and cons of size. Here are what I see as the key advantages that a large fund has over a small trader (or a small fund for that matter). I've listed them in order of importance - most important first. 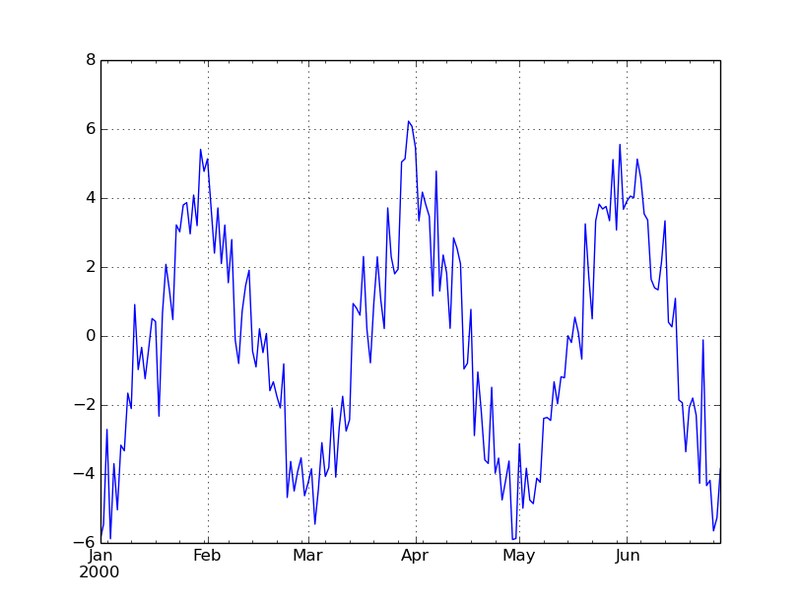 A larger fund can trade a much wider set of instruments; 100 - 300 versus the 40 or so futures markets that I trade. Diversification is the only free lunch in finance, and diversification across instruments rather than trading strategies is much more powerful since the correlations are lower. I estimate that I should be able to get a sharpe ratio around 30% higher if I could trade 300 instruments rather than 40. The main reason why large funds can invest in more markets is because they are ... large (this is the level of deep intellectual analysis you have come to expect from this blog). If you are a tiny investor with just a few thousand dollars in capital then in the futures trading world at least you're going to trade even a low risk market like the German Shatz future. To trade something like the japanese government bond future, which has a nominal size over a million bucks, you need to have a pretty substantial account size (assuming you don't want it to be a huge chunk of your portfolio risk allocation). Institutions can trade over the counter markets, whilst retail investors are mostly limited to exchange traded (excluding the wild west of retail FX trading of course). Large funds can afford to employ large numbers of people in back and middle offices who can worry about painful things like ISDA agreements. Also they can employ execution traders who understand how to trade the markets, and who can ring brokers and banks and say "Hi I'm calling from NAME OF LARGE FUND and I'd like to trade credit derivatives". Within minutes a team of salespeople will be round your fund salivating at the prospect of being your business partner. If I called brokers and banks I might get lucky and find someone I used to work with to buy me lunch, but I won't get a trading agreement set up any time soon. Even running a systematic, fully automated, fund requires some work. I spend a few minutes each month for every instrument I trade dealing with bad prices and deciding when to roll. If I were to trade a couple of hundred futures, then my workload would be enormous - perhaps a week a month. With a technical futures system however this workload is still within the scope of an individual trader (as long as they aren't as lazy as I am). However if you were trading long-short equities, with a larger universe of instruments than in futures, and more types of fundamental data, then having more a few more people would be good. For a given size of trade larger funds should get better execution - lower slippage between the mid price and the fill price. * Clearly large funds will do larger trades - I'll talk about this later in the post. Large funds can invest in researching smart execution algos, much more sophisticated than the simpler stuff I do. 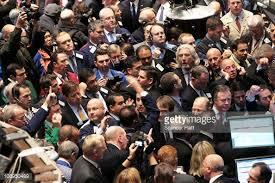 However more importantly they can employ experienced execution traders to execute trades manually. In certain markets these guys will do much better than an algo (of course in certain OTC markets an algo won't be any good anyway, since there are no automated trading mechanisms). I could execute my own trades manually if I wasn't so idle (and there's no way I'd get up early enough to trade Korea...), but I wouldn't do as good a job as a good execution guy would. Note that the benefits of smarter execution are more powerful once you are doing larger trades; so all this category does is allow large funds to partially overcome one of their main disadvantages. Institutional investors pay lower commissions than retail investors do. This is pure market pricing power being exercised. If I'm trading billions of futures contracts a year I'm going to get a better deal than if I'm trading thousands. I expect to pay around 30bp of my fund value in commissions; I'd expect to be able to halve that or better if I was a large fund. Adding 15bp to performance isn't going to change the world, but every little helps. Having more people means you can have specialists. I'm an okay programmer, not a bad trader, I know a bit of economics, and I'm vaguely okay at statistical analysis. I've managed to teach myself the bare minimum of accounting to properly analyse my p&l. The point is I have to do all this stuff myself. I'm not even playing to my strengths; if I had a full time programmer working for me I'd be able to focus on developing better trading rules. (I'm not moaning by the way, I enjoy dabbling in programming and having full control of the whole process). However a large fund can hire people to do each of these functions seperately. They can afford to hire top notch programmers, excellent execution traders, super statisticians and brilliant economists; as well as all the other people you need to run an institutional fund. This will add something to performance, but not a vast amount (except in specialist areas like high frequency trading where the difference between profits and losses is having someone who knows how to build a low latency trading system). It's hard to quantify how much exactly. Related to the previous point most people assume the main advantage of a large fund is that they have a huge team of really smart people refining and developing models. Personally I'm less confident this is the case. I believe that a suite of relatively simple, well known, trading models will get you 95% or more of the performance of a more sophisticated complex set of trading rules (at least at the trading frequency I usually occupy). So I believe one relatively stupid person (myself) can do almost as well as a team of very smart people. But maybe I'm being stupid. What is David's sling in this story, or if you prefer what can a small trader do that a large fund can't? Again I've listed these in order of importance, key point first. Large funds have investors, often themselves large institutions like pension funds. Large institutional investors buy funds not just because they think they are going to do well, but because they have a certain style such as trend following. To an extent this is rational because it's very hard to predict performance; but putting together a series of funds which are diversified across styles is an excellent way of constructing a portfolio. What this means in practice is that funds might not be able to make as much in absolute return as they could in theory. If investors want to buy a trend following fund, but the optimal allocation to trend following is only 40%, then the fund will under perform someone who can put 60% into other trading rules even if the set of rules they haven't isn't quite as good. If you invest in a fund you have to pay fees. If you invest or trade your own money, they you don't. Depending on how you value the opportunity cost of your own time, and how much time you spend on trading, this may or may not make sense. But it's certainly true that you'll get a higher absolute return from not having to pay fees. The biggest mistake when trading a systematic system is to meddle. As an individual trader it's not easy to avoid meddling, but I usually manage to do so as I can't face the work involved. However I do believe that institutional pressures lead to models changing and frequent overrides. Smaller traders do smaller trades (for a given average holding period and leverage). If your trading size is always less than what is available at the inside spread then the most you should have to pay is half the spread. However as I noted above large funds can employ resources to reduce the size of this effect. I would say that a large fund has the edge, but it's perhaps closer than you might think, and the advantages they have aren't necessarily those you'd expect to be the most important. As it happens after my first year of trading I was being beaten by my former employer, AHL - a large fund, with a Sharpe of 4.0 vs my paltry 2.8 (okay it was a good year all round - this is about 3 times the long average SR I'd expect to see!). So far this year (where both the large funds and myself haven't been doing quite as well) has been closer - and just for fun I'll update this comparision in April 2016. Random data: Evaluating "Trading the equity curve"
Quite a few people seem to think that "trading the equity curve" is the answer. The basic idea is that when you are doing badly, you reduce your exposure (or remove it completely) whilst still tracking your 'virtual' p&l (what you would have made without any interference). Once your virtual p&l has recovered you pile back into your system. The idea is that you'll make fewer losses whilst your system is turned off. It sounds too good to be true... so is it? The aim of this post is to try and answer that question. This is something that I have looked at in the past, as have others, with mixed results. However all the analysis I've seen or done myself has involved looking at backtests of systems based on actual financial data. I believe that to properly evaluate this technique we need to use large amounts of random data, which won't be influenced by the fluke of how a few back tests come out. This will also allow us to find which conditions will help equity curve trading work, or not. This is the second post in a series on using random data. The first post is here. How do we trade the equity curve? I'm going to assume you're reasonably familiar with the basic idea of equity curve trading. If not, then its probably worth perusing this excellent article from futures magazine. A way of identifying that the system is 'doing badly', and quantifying by how much. I've seen two main ways for identifying that the system is doing badly. The first is to use a straightforward drawdown figure. So, for example, if your drawdown exceeds 10% then you might take action. 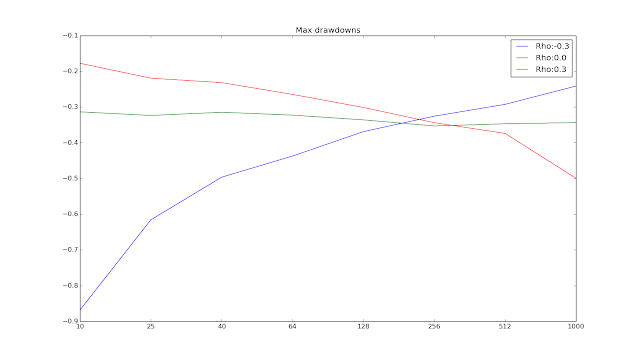 The second variation is to use a moving average (or some other similar filter) of the account curve. If your account curve falls below the moving average, then you take action. As for degearing your system, broadly speaking you can eithier degear it all in one go, or gradually. Usually if we dip below the moving average of an equity curve then it is suggested that you cut your position entirely. Whilst if you are using the current drawdown as your indicator, then you might degear gradually: drawdown; then by another 20% for a total of 40% when you hit a 20% drawdown and so on. Note that this degearing will be in addition to the normal derisking you should always do when you lose money; if you lose 10% then you should derisk your system by 10% regardless of whether you are using an equity curve trading overlay. Finally the 'regearing' rule is normally the reverse of the degearing rule and process. 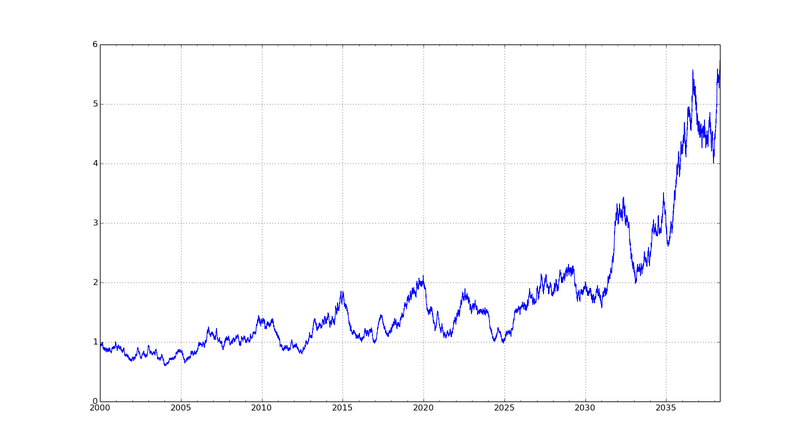 The idea of trading the equity curve is something that seems to have bypassed academic researchers (unless they are calling it something else - please write in if you know about any good research) so rather than any formal literature review I had a quick look at the first page of google. I personally find the above research interesting, but not definitive one way or another. My main issue is that it was all done on different financial instruments and different kinds of trading systems, which unsuprisingly gave different results. This might be because there is something 'special' about those instruments where equity curve trading worked, but it's more likely to be just dumb luck. Note: It is slightly more plausible that different kinds of trading rules will give different results; and we'll explore this below. I personally think that we can't properly evaluate this kind of overlay without using random data. By generating returns for different arbitrary trading strategies we can then judge whether on average equity curve trading will be better. Another advantage of using random data to evaluate an equity curve overlay system is that we avoid potentially overfitting. If we run one version of the overlay on our system, and it doesn't work, then it is very tempting to try a different variation until it does work. Of course we could 'fit' the overlay 'parameters' on an out of sample basis. But this quite a bit of work; and we don't really know if we'd have the right parameters for that strategy going forward or if they just happened to be the best for the backtest we ran. 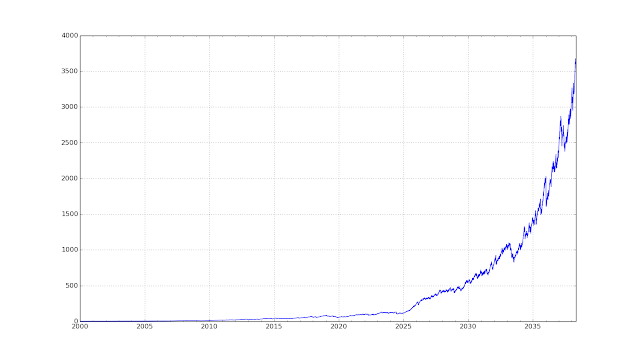 Finally using random data means we can discover what the key characteristic of a trading system is that will allow trading the equity curve to work, or not. There are probably an infinite variety of methods of doing an equity curve trading overlay (of which I touched on just a few above). However to avoid making this already lengthy post the size of an encylopedia I am going to limit myself to testing just one method. In any case I don't believe that the results for other methods will be substantially different. "When the equity curve falls below it's N day moving average, turn off the system. Keep calculating the 'virtual' curve, and it's moving average during this period. When the 'virtual' curve goes back above it's moving average then turn the system back on"
That just leaves us with the question of N. Futures magazine uses 10, 25 and 40 days and to make life simple I'll do the same. However to me at least these seem incredibly short periods of time. For these faster N trading costs may well overwhelm any advantage we get (and I'll explore this later). Also wouldn't it be nice to avoid the 3 year drawdown in trend following that happened between 2011 and 2013? Because we're using random data (which we can make as long as we like) we can use longer moving averages which wouldn't give us meaningful results if we tested just a few account curves which were 'only' 20 years long. A nice way of thinking about equity curve trading is that it is a bit like buying insurance, or in financial terms a put option on your system's performance. If your system does 'badly' then the insurance policy prevents you from losing too much. One of my favourite acronyms is TINSTAAFL. If we're buying insurance, or an option, then there ought to be a cost to it. Since we aren't paying any kind of explicit premium, the cost must come in the form of losing something in an implicit way. This could be a lower average return, or something else that is more subtle. This doesn't mean that equity curve trading is automatically a bad thing - it depends on whether you value the lower maximum drawdown* more than the implicit premium you are giving up. * This assumes we're getting a lower maximum drawdown - as we'll see later this isn't always the case. I can think of a number of ways of evaluating performance which try and balance risk and reward. Sadly the most common, Sharpe Ratio, isn't appropriate here. 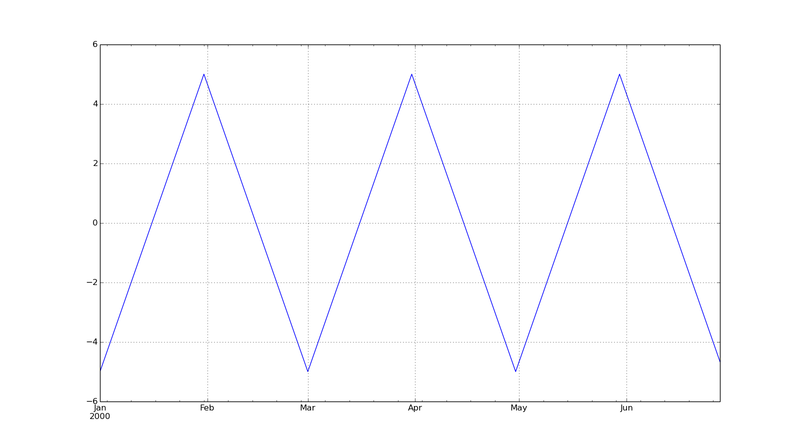 The volatility of the equity curve with the overlay on will be, to use a technical term, weird - especially for large N. Long periods without returns will be combined with periods when return standard deviation is normal. So the volatility of the curve with an overlay will always be lower; but it won't be a well defined statistic. Higher statistical moments will also suffer. My plan is to generate a random account curve, and then measure all the above. Then I'll pass it through the equity overlay, and remeasure the statistics. Finally just to note that for most of this post I won't be considering costs. For small N, given we are closing our entire strategy down and then restarting it potentially every week, these could be enormous. Towards the end I will give you an idea of how sensitive the findings are to the costs of different trading instruments. Notice that an obvious danger of this process is making random data that is 'too good'. In an extreme case with enough degrees of freedom you could end up producing 'random' data which looks exactly like the data you calibrated it against! There is a balance between having random data that is realistic enough for the tests you are running, and 'over calibrated'. 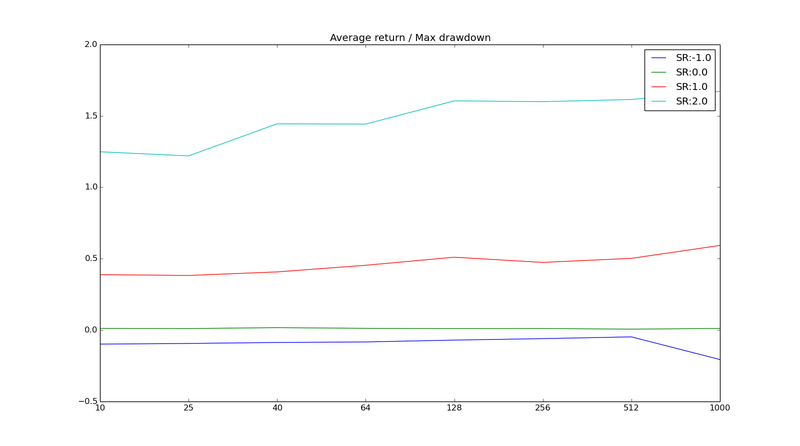 What characteristics of a trading system returns will affect how well an equity curve overlay will work? As in my previous post I'll be producing returns that have a particular volatility target - that won't affect the results. They will also have a given expected Sharpe Ratio. With a negative Sharpe Ratio equity curve overlay should be fantastic - it will turn off the bad system. With a high positive Sharpe Ratio they will probably have no effect (at least for large enough N). It's in the middle that things will get more interesting. I'll test Sharpe Ratios from -2 to +2. My intuition is that skew is important here. Negative skew strategies could see their short, sharp, losses reduced. Positive skew such as trend following strategies which tend to see slow 'bleeds' in capital might be improved by an overlay (and this seems to be a common opinion amongst those who like these kind of systems). I'll test skew from -2 (average for a short volatility or arbitrage system) to +1 (typical of a fast trend following system). 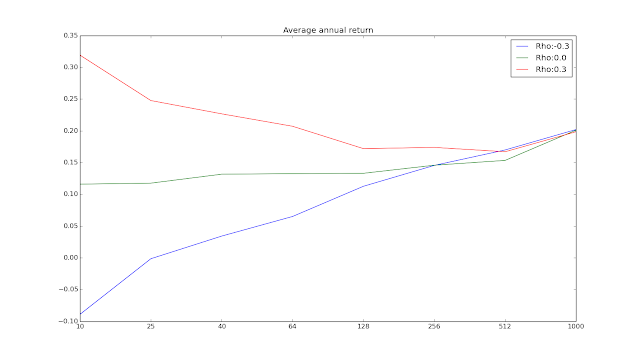 Finally I think that autocorrelation of returns could be key. If we tend to get losses one after the other then equity curve trading could help turn off your system before the losses get too bad. First then for the calibration stage we need some actual returns of real trading systems. The systems I am interested in are the trading rules described in my book, and in this post: a set of trend following rule variations (exponentially weighted moving average crossover, or EWMAC for short) and a carry rule. First skew. The stylised fact is that trend following, especially fast trend following, is positive skew. However we wouldn't expect this effect to occur at frequencies much faster than the typical holding period. Unsurprisingly daily returns show no significant skew even for the very fastest rules. At a weekly frequency the very fastest variations (2,8 and 4,16) of EWMAC have a skew of around 1.0. At a monthly frequency the variations (8,32 and 16,64) join the positive skew party; with the two slowest variations having perhaps half that. Carry doesn't see any of the negative skew you might expect from say just fx carry; although it certainly isn't a positive skew strategy. There is plenty of research showing that trend following rules produce returns that are typically negatively autocorrelated eg http://www.valuewalk.com/2015/09/autocorrelation-of-trend-following-returns-illusion-and-reality/ and http://www.trendfollowing.com/whitepaper/newedge.pdf. The latter paper suggests that equities have a monthly autocorrelation of around +0.2, whilst trend following autocorrelations come in around -0.3. Carry doesn't seem to have a significant autocorrelation. My conclusion is that for realistic equity curves it isn't enough just to generate daily returns with some standard deviation and skew. We need to generate something that has certain properties at an appropriate time scale; and we also need to generate autocorrelated returns. I'll show the effect of varying skew between -2 and +1, autocorrelation between -0.3 and +0.3, and Sharpe Ratio between -1 and +2. In the previous post I showed how to generate skewed random data. Now we have to do something a bit fancier. This section is slightly technical and you might want to skip if you don't care where the random data comes from as long as it's got the right properties. The classic way of modelling an autocorrelated process is to create an autoregressive AR1 model* (note I'm ignoring higher autoregression to avoid over calibrating the model). * This assumes that the second, third, ... order autocorrelations follow the same pattern as they would in an AR1 model. 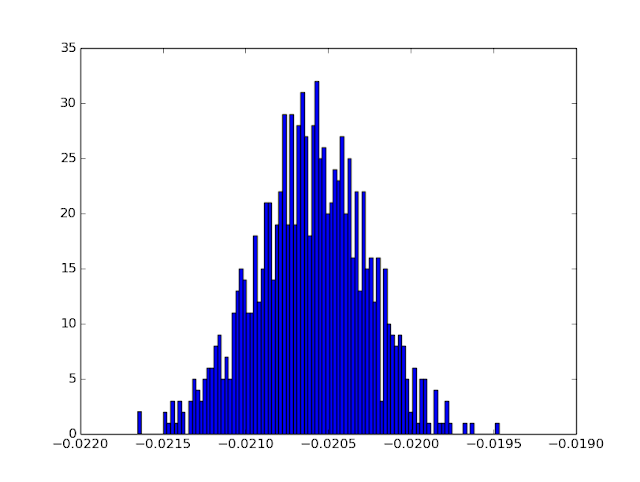 Where Rho is the desired autocorrelation and e_t is our error process: here it's skewed gaussian noise*. * Introducing autocorrelation biases the other moments of the distribution. I've included corrections for this which works for reasonable levels of abs(rho)<0.8. You're unlikely to see anything like this level in a real life trading system. 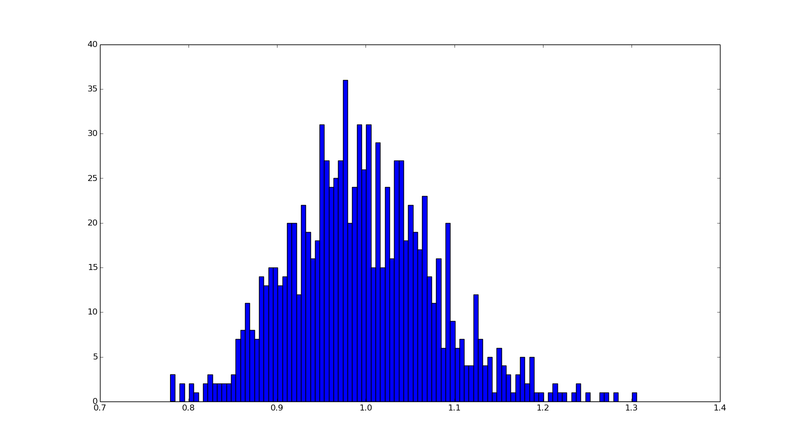 This python code shows how the random data is produced, and checks that it has the right properties. Now, how do we deal with different behaviour at different frequencies? There are very complicated ways of dealing with this (like using a Brownian bridge), but the simplest is to generate returns at a time scale appropriate to the speed of the indicator. This implies weekly returns for carry and fast EWMAC rules(2,4 and 4,8); and monthly for slower EWMAC rules. If you're trading a very fast trading rule then you should generate daily data, if you see a clear return pattern at that frequency. I'll use daily returns for the rest of this post, but I've checked that they still hold true at weekly and monthly frequencies (using equity curve filter lookbacks at least 3 times longer than the frequency of returns we're generating). 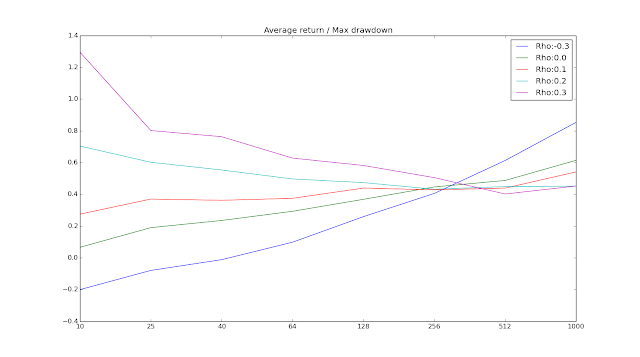 To recap I am going to be TESTING different lookbacks for the equity curve filter; and I am going to be GENERATING returns with skew between -2 and +1, autocorrelation between -0.4 and +0.4, and Sharpe Ratio between -1 and +2. I'll keep standard deviation of returns constant, since that will just change the overall scale of each process and not affect the results. I'll look at the results with daily returns. The results won't be significantly different with other periods. All the code you need is here. In this section I'll be varying the Sharpe Ratio whilst keeping the skew and autocorrelation fixed (at zero, and zero, respectively). All of the plots that follow have the same format. 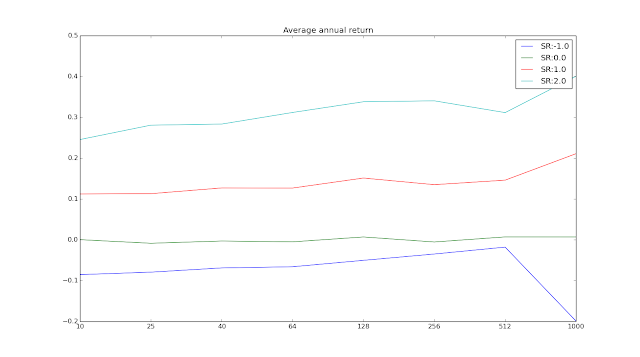 Each line shows a different level of return characteristic (Sharpe Ratio in this case). The x axis shows the equity curve filter N day count that we're using for the moving average. Note that N=1000, which is always on the right hand side, means we aren't using a filter at all. The y axis shows the average value of the statistic of interest (in this case average annual return) across all the random equity curves that we generate and filter. The good news is if you know you're trading system is rubbish, then applying an equity curve system, preferably with large N, improves the performance. If you knew your system was rubbish then of course rather than use a complicated filter to turn it off you wouldn't bother turning it on at all! 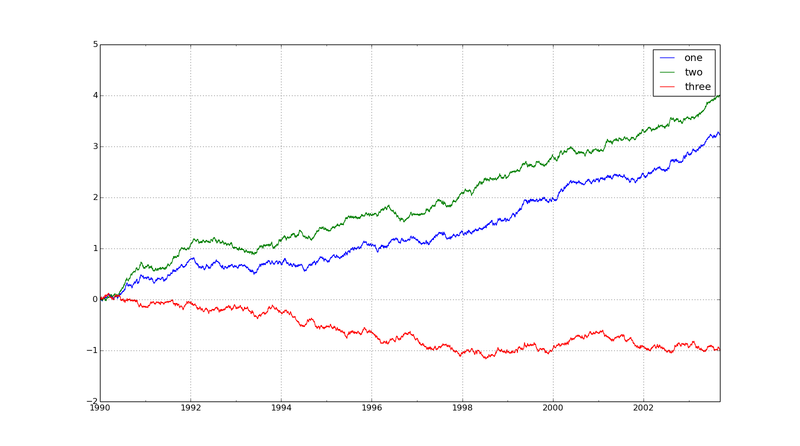 However for all profitable equity curves equity curve trading reduces, rather than increases, your returns. 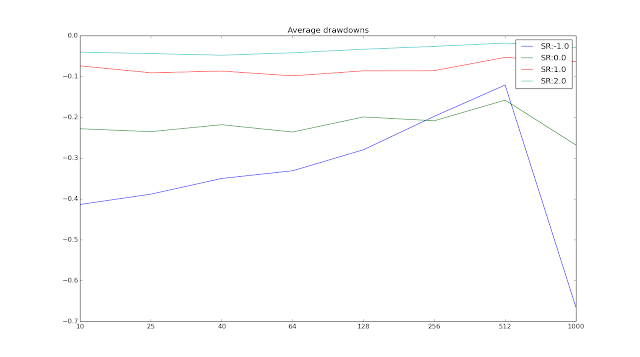 Again for systems which break even or lose money the average drawdown is lower with an equity curve trading system, as you might expect; again especially for large N. However for profitable systems there is no benefit, and average drawdowns may even be slightly worse. 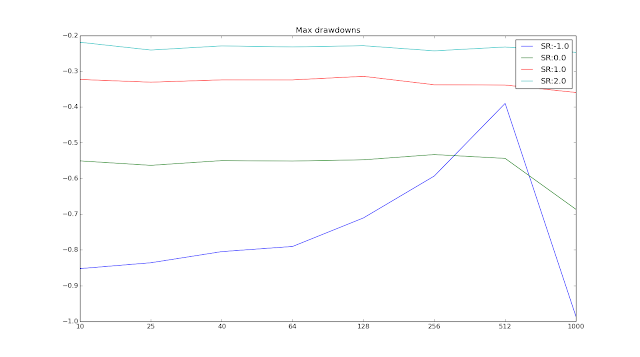 For profitable systems there might perhaps be a modest reduction in maximum drawdown for small values of N. For loss making systems the biggest reduction in drawdown is for large values of N; although all filters are better than none. Let's now try and put together the return and drawdown into a simple statistic. For unprofitable systems the overlay makes no difference. 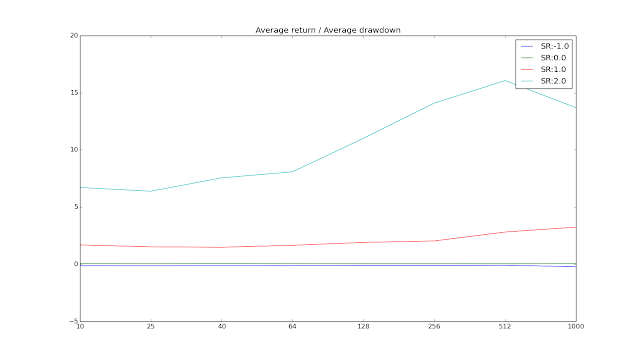 For profitable systems it reduces the drawdown adjusted return (the 'hump' at the right hand side of the SR=2.0 line is an artifact caused by the fact we can't calculate this statistic when the average drawdown is zero). This statistic tells the same story. 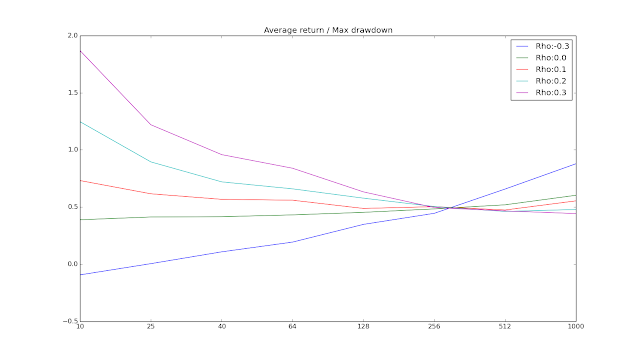 For a profitable system applying an equity curve overlay reduces the average return / max drawdown ratio; with faster overlays (small N) probably worse (and they would be much, much worse with trading costs applied). If you have a system that definitely loses money then applying an overlay, of any lookback, will mitigate your losses. In this section I'll be varying the Skew whilst keeping the Sharpe Ratio and autocorrelation fixed (at one, and zero, respectively). To save time let's jump ahead to the calculated statistics. Bluntly my intuition was wrong; skew makes no difference. The overlay harms returns for all skew values shown here. There is a similar story for return / max drawdown. In this section I'll be varying the Autocorrelation whilst keeping the skew and Sharpe Ratio fixed (at zero, and one, respectively). Well hang on... we have a result. If you have negative or zero autocorrelation then adding an equity curve overlay will make your returns much worse. But if you have positive autocorrelation it will improve them, with faster overlays doing best (remember we're ignoring costs here). This makes sense. 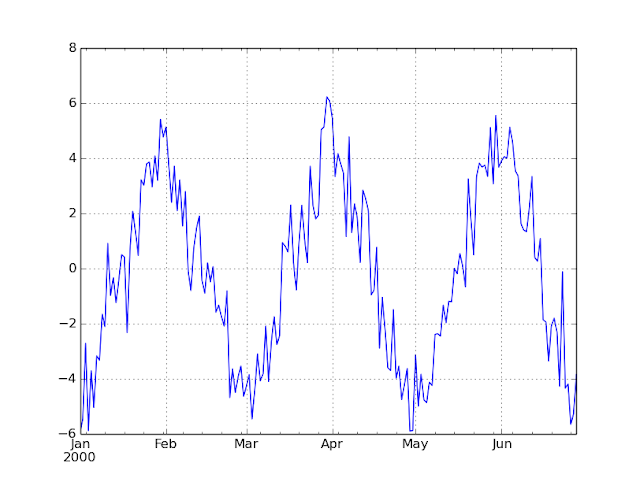 After all if something has positive autocorrelation then we'd want to trend follow it. However as we've already discussed trend following systems seem to have negative autocorrelation. So it looks like equity curve overlays are a no-no for a trend following system. 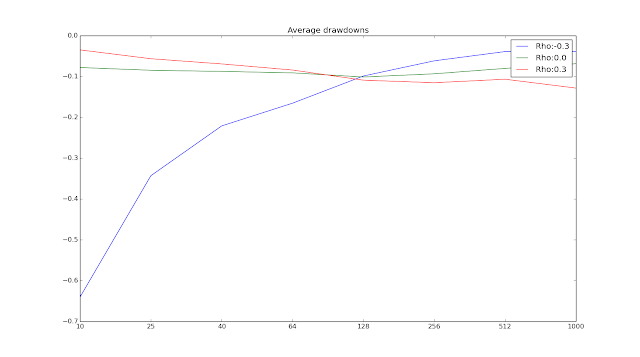 Again drawdowns are improved only if the autocorrelation is positive. They are much worse if it is negative (note that average drawdowns are smaller for negatively autocorrelated systems anyway). 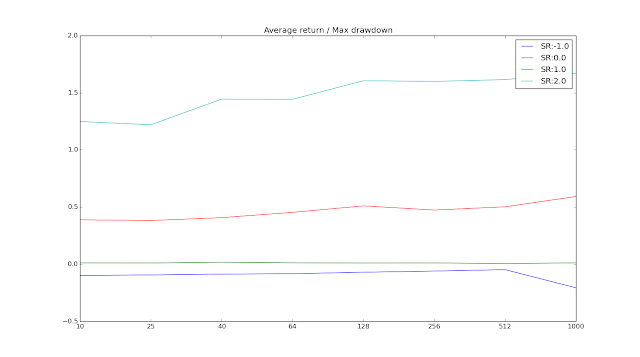 There is a similar picture for maximum drawdown. I've added more lines to this plot (scenario_type="VaryingAutoMore") to see if we can find the 'break even' point at which you should use an equity curve overlay. 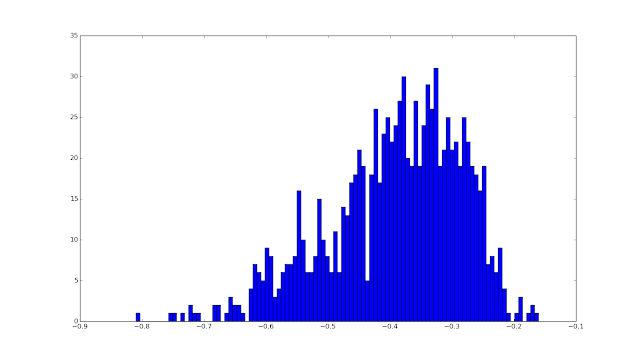 It looks like for autocorrelation of 0.2 or greater, with an N length of 40 days or less. Remember that I haven't included costs in any of these calculations. For information the annualised turnover added to each system by the equity curve filter ranges from around 23 for N_length 10 to 1.2 for N_length 512. With the cheapest futures I trade (standardised cost of 0.001 SR units per year, for something like NASDAQ) this is not a major problem, reducing average return with N length of 10 by around 1%. However let's see the results using a more expensive future, the Australian interest rate future, with a cost of around 0.03 SR units per year. With costs smaller N look much worse. I'd suggest that at this cost level you need a positive autocorrelation of at least 0.2 before even considering trading the equity curve. ... and again only a higher autocorrelation will do. The idea that you can easily improve a profitable equity curve by adding a simple moving average filter is, probably, wrong. 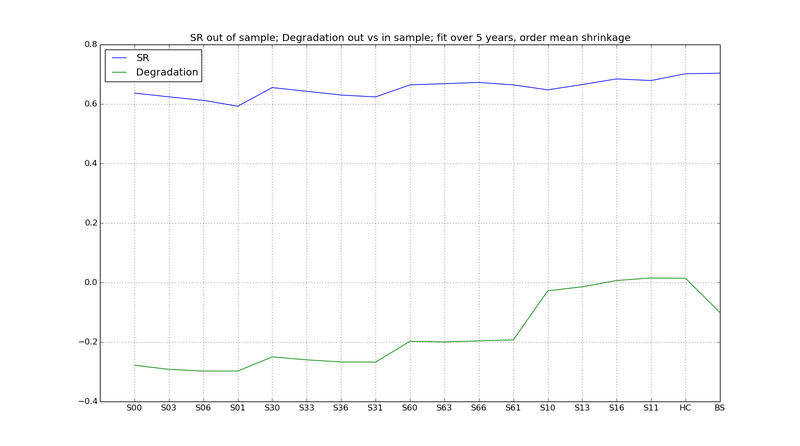 This result is robust across different positive sharpe ratios and levels of skew. Using a shorter moving average for the filter is worse than using a slower one, even if we ignore costs. There is one exception. If your trading strategy returns show positive autocorrelation then applying a filter with a relatively short moving average will probably improve your returns, but only if your trading costs are sufficiently low. However if your strategy is a trend following strategy, then it probably has negative autocorrelation, and applying the filter will be an unmitigated disaster. This is the second post in a series on using random data. The first post is here. The next post on portfolio optimisation is here. As you might expect I spend quite a lot of my time using real financial data - asset prices and returns; and returns from live and simulated trading. It may surprise you to know that I also spend time examining randomly created financial data. This post explains why. I also explain how to generate random data for various purposes using both python and excel. I'll then give you an example of utilising random data; to draw conclusions about drawdown distributions and other return statistics. This is the first in a series of three posts. I intend to follow up with three more posts illustrating how to use random data - the second will be on 'trading the equity curve' (basically adjusting your system risk depending on your current performance), and the third illustrating why you should use robust out of sample portfolio allocation techniques (again covered in chapter 4 of my book). As systematic traders we spend a fair amount of our time looking backwards. We look at backtests - simulations of what would have happened if we ran our trading system in the past. We then draw conclusions, such as 'It would have been better to drop this trading rule variation as it seems to be highly correlated with this other one', or 'This trading rule variation holds it's positions for only a week', or 'The maximum drawdown I should expect is around 20%' or 'If I had stopped trading once I'd lost 5%, and started again once I was flat, then I'd make more money'. However it is important to bear in mind that any backtest is to an extent, random. I like to think of any backtest that I have ran as a random draw from a massive universe of unseen back tests. Or perhaps a better way of thinking about this is that any financial price data we have is a random draw from a massive universe of unseen financial data, which we then run a backtest on. This is an important concept because any conclusions you might draw from a given backtest are also going to randomly depend on exactly how that backtest turned out. For example one of my pet hates is overfitting. Overfitting is when you tune your strategy to one particular backtest. But when you actually start trading you're going to get another random set of prices, which is unlikely to look like the random draw you had with your original backtest. In fact really every time you look at an equity curve you ought to draw error bars around each value to remind you of this underlying uncertainty! I'll actually do this later in this post. Use as many different samples of real data as possible - fit across multiple instruments and use long histories of price data not just a few years. Resample your real data to create more data. For example suppose you want to know how likely a given drawdown is. 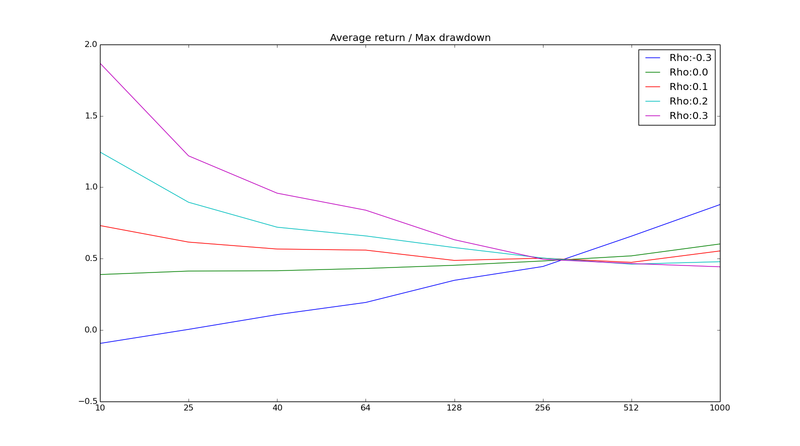 You could resample the returns from a strategies account curve, see what the maximum drawdown was, and then look at the distributions of those maximum drawdowns to get a better idea. Resampling is quite fun and useful, but I won't be talking about it today. Generate large amounts of random data with the desired characteristics you want, and then analyse that. This post is about the fourth method. I am a big fan of using randomly generated data as much as possible when designing trading systems. Using random data, especially in the early stages of creating a system, is an excellent way to steer clear of real financial data for as long as possible, and avoid being snared in the trap of overfitting. Random price data, on which I then run a backtest. This is good for examining the performance of individual trading rules under certain market conditions. We need to specify: the process that is producing the price data which will be some condition we like (vague I know, but I will provide examples later) plus Gaussian noise. Random asset returns. The assets in question could be trading rule variations for one instrument, or the returns from trading multiple instruments. This is good for experimenting with and calibrating your portfolio optimisation techniques. We need to specify: The Sharpe ratio,standard deviation and correlation of each asset with the others. Generating prices for multiple instruments. So this rules out testing relative value rules, or those which use data from different places such as the carry rule. It is possible to do this of course, but you need to specify the process by which the prices are linked together. 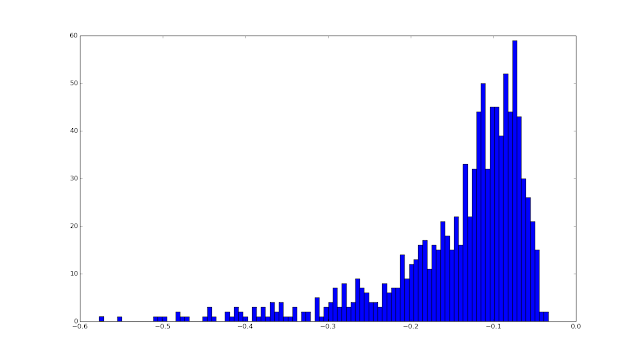 Skewed asset returns (or indeed anything except for a normal, symmettric Gaussian distribution). Again in principle it's possible to do this, but rather complicated. 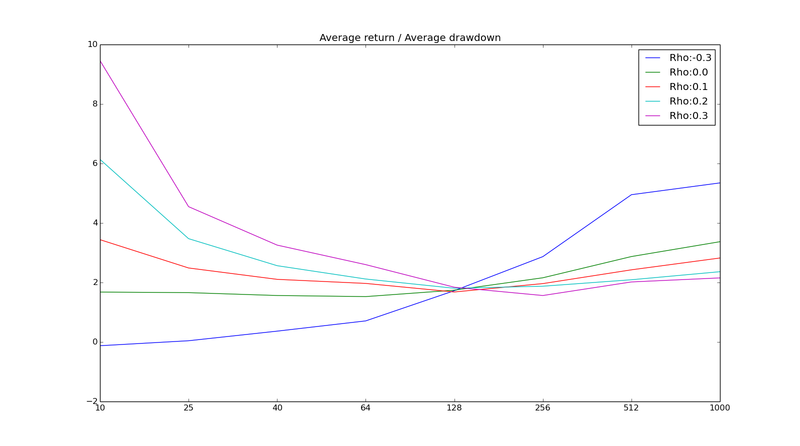 Backtest returns which have ugly kurtosis, jumps, or anything else. Generally the more complicated your random model is, the more you will have to calibrate your random model to real data to produce realistic results, and you will start to lose the benefits. To make random price series we need two elements: an underlying process and random noise. The underlying process is something that has the characteristics we are interested in testing our trading rules against. On top of that we add random gaussian noise to make the price series more realistic. The 'scale' of the process is unimportant (although you can scale it against a familiar asset price if you like), but the ratio of that scale to the volatility of the noise is vital. Underlying processes can take many forms. The simplest version would be a flat line (in which case the final price process will be a random walk). The next simplest version would be a single, secular, trend. Clearly the final price series will be a random walk with drift. The process could also for example be a sharp drop. Rather than use those trivial cases the spreadsheet and python code I've created illustrate processes with trends occuring on a regular basis. It's for three assets but you should be able to adapt it easily enough. Here is an example of the python code running. 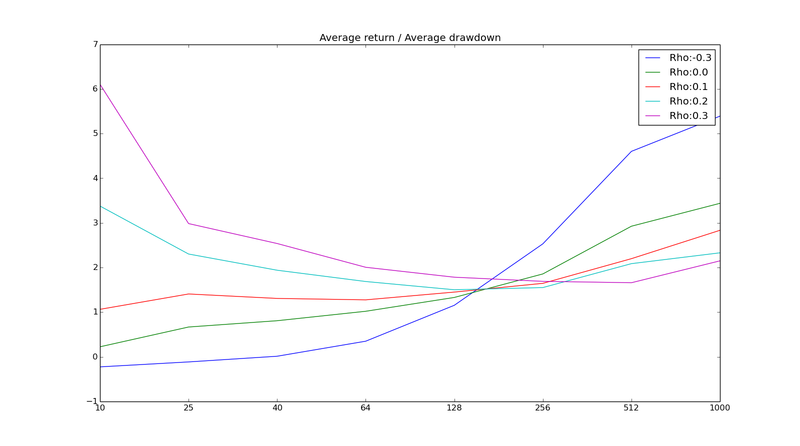 Notice the code generates returns, these are cumulated up to make an equity curve. We'll be using this kind of random price data in the final post of this series (why you should use robust out of sample portfolio optimisation techniques). Spreadsheet: There are a number of resources on the internet showing how skewed returns can be generated in excel including this one. Ah the joys of compounding. But look out for the short, sharp, shocks of negative skew. We'll use this python code again in the example at the end of this post (and in the next post on trading the equity curve). What can we use random data for? What shouldn't we use random data for? Random data cannot tell you how profitable a trading rule was in the past (or will be in the future... but then nothing can tell you that!). It can't tell you what portfolio weights to give to instruments or trading rule variations. For that you need real data, although you should be very careful - the usual rules about avoiding overfitting, and fitting on a pure out of sample basis apply. Use the allocation method and real data to set the forecast weights (allocations to trading rule variations) and instrument weights; on a pure out of sample basis (eg expanding window). Using random data decide on my capital scaling strategy - volatility target, use of Kelly scaling to reduce positions in a drawdown, trade the equity curve and so on (I'll give an example of this in the next post of this series). Notice we only use real data once - the minimum possible. The average return, volatility and skew. Let's go through the python code and see what it is doing (some lines are missed out for clarity). First we create 1,000 equity curves, with the default annualised volatility target of 20%. If your computer is slow, or you have no patience, feel free to reduce the number of random curves. Each of the light lines is a single equity curve. Note to make the effects clearer here I am adding up percentage returns, rather than applying compound interest properly. 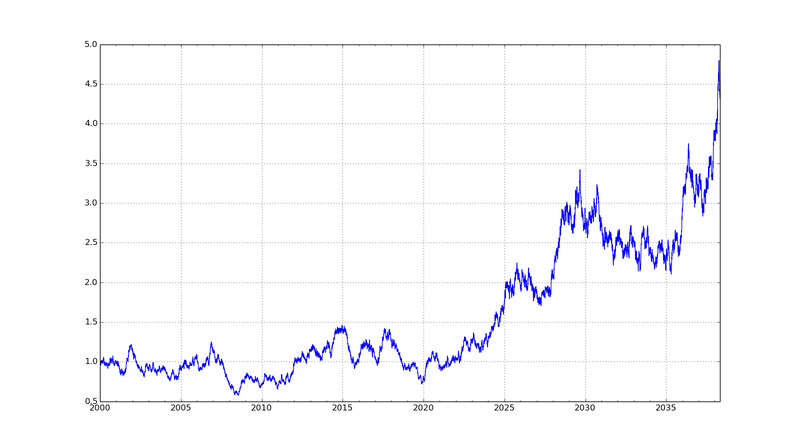 Alternatively I could graph the equity curves on a log scale to get the same picture. All have an expected Sharpe Ratio of 0.5, but over 10 years their total return ranges from losing 'all' their capital (not in practice if we're using Kelly scaling), to making 3 times our initial capital (again in practice we'd make more). The dark line shows the average of these curves. So on average we should expect to make our initial capital back (20% vol target, multiplied by Sharpe Ratio of 0.5, over 10 years). 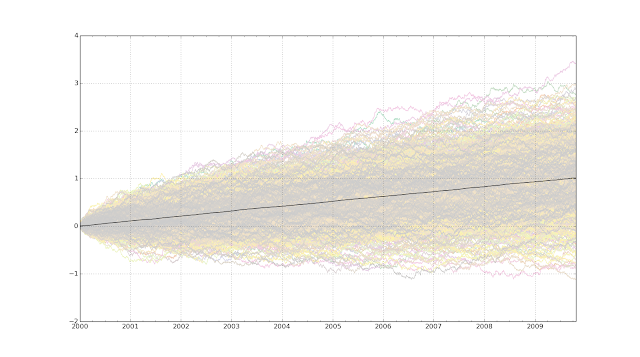 Notice that the cloud of equity curves around the average gives us an indication of how uncertain our actual performance over 10 years will be, even if we know for sure what the expected Sharpe Ratio is. 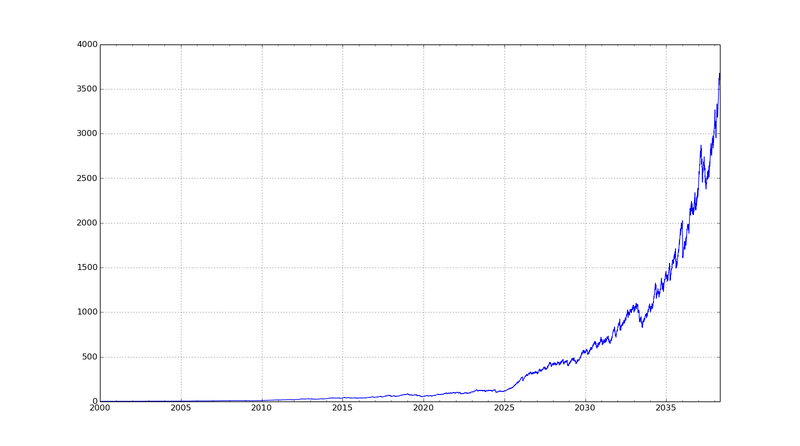 This picture alone should convince you of how any individual backtest is just a random draw. * Of course in the real world we don't know what the true Sharpe Ratio is. We just get one of the lighted coloured lines when we run a backtest on real financial data. From that we have to try and infer what the real Sharpe Ratio might be (assuming that the 'real' Sharpe doesn't change over time ... ). This is a very important point - never forget it. Note that to do our analysis we can't just look at the statistics of the black line. It has the right mean return, but it is way too smooth! Instead we need to take statistics from each of the lighter lines, and then look at their distribution. 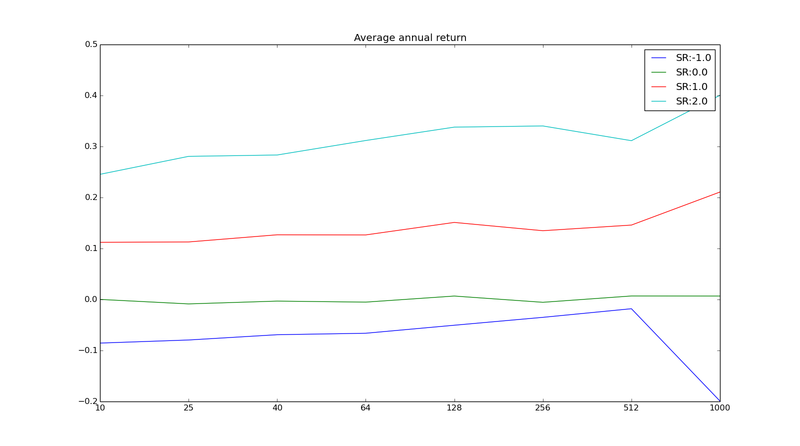 As you'd expect the average return clusters around the expected value of 10% (With a Sharpe ratio of 0.5 and an annualised volatility target that is what you'd expect). But it's not unlikely that even over 10 years we'd see losses. The realised annual standard deviation of returns is much more stable. Of course this isn't realistic. It doesn't account for the fact that a good trading system will reduce it's risk when opportunities are poor, and vice versa. It assumes we can always target volatility precisely, and that volatility doesn't unexpectedly change, or follow a different distribution to the skewed Gaussian we are assuming here. But all those things apply equally to the mean - and that is still extremely unstable even in the simplified random world we're using here. 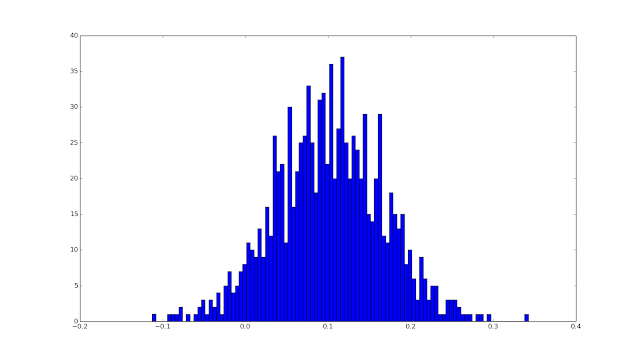 Skew is also relatively stable (in this simplified random world). I plotted this to confirm that the random process I'm using is reproducing the correct skew (in expectation). This graph answers the question "Over a 10 year period, how bad should I expect my typical worst 1 in 250 business day (once a year) loss to be?" (with the usual caveats). As an exercise for the reader you can try and reproduce similar results for different percentile points, and different return periods. So most of the time an average drawdown of around 10 - 20% is expected. However there are some terrifying random equity curves where your average drawdown is over 50%. So over 10 years you'll probably get a worst drawdown of around 40%. You might look at the backtest and think "I can live with that". However it's not impossible that you'll lose three quarters of your capital at times if you're unlucky. You really do have to be prepared to lose all your money. Clearly I could continue and calculate all kinds of fancy statistics; however I'm hoping you get the idea and the code is hopefully clear enough. As promised there will be two more posts in this series. 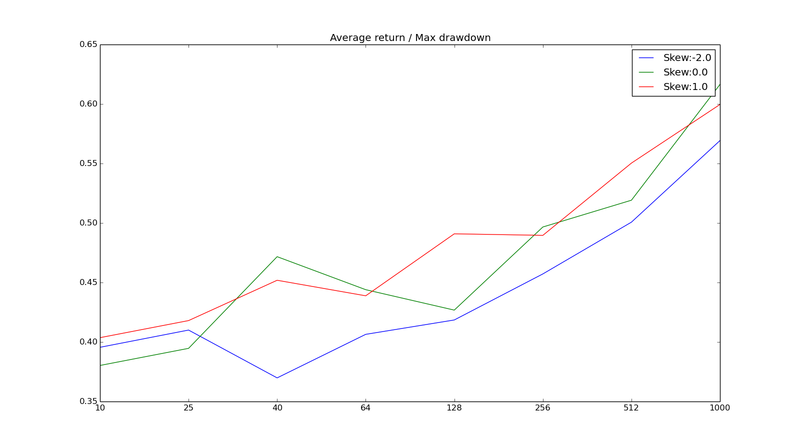 In the next post I'll look at using random backtest returns to see if 'trading the equity curve' is a good idea. Finally I'll explore why you should use robust portfolio optimisation techniques rather than any alternative. A thousand apologies but the definition of the carry rule for futures in Appendix B of my book "Systematic Trading" is incorrect. The spreadsheet here was also wrong and is now corrected. My python code was already correct; which is a relief as I use this rule in my own trading :-). The figures and explanations of the rule in chapter seven are fine, as are the calculations for other asset classes in Appendix B.
I'd like to thank the reader (Raphael C) who pointed this error out to me.